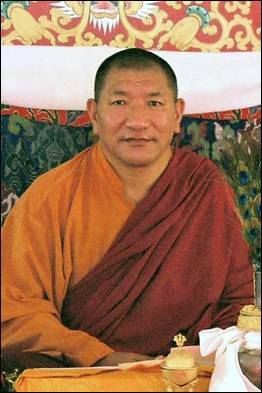 Gyurme Tenpa Gyaltsen aka the Fourth Katok Getse Rinpoche (1954-2018) was one of the five ‘’Golden Throne’’ holders of the Katok Monastery lineage, a branch of the Nyingma tradition. At the Nyingma Mönlam in Bodhgaya, January 2018, Rinpoche was appointed to be the supreme head of the Nyingma Tradition for three years. ”Katok Getse Rinpoche, like his previous incarnations, illuminates the teachings of Nyingma, the first Buddhist doctrine of Tibet, and embodies a great living legacy of the Buddhist teachings. Furthermore, some in his series of incarnations have a connection with the past incarnations of the Dalai Lama. For example, when Katok Tsewang Norbu went to Lhasa, the Seventh Dalai Lama, Kalzang Gyatso, held him in high regard and asked him to reverse, through ritual, the Mongolian army in northern Tibet, which he did. The Seventh Dalai Lama, greatly pleased, offered him a handsome reward. The true reincarnation of Katok Rigdzin Tsewang Norbu was the First Katok Getse, Gyurme Tsewang Chokdrup. When he came to Lhasa on pilgrimage he met the Eighth Dalai Lama, Jampal Gyatso, and the two of them immediately began exchanging teachings. This association became an inexhaustible offering that pleased all the buddhas, and great mutual respect developed between them. Later, the Third Katok Getse, Gyurme Tenpa Namgyal, came to Lhasa to meet the Thirteenth Dalai Lama, Thupten Gyatso. He was received with joy and they developed a good relationship. His direct reincarnation, the Fourth Katok Getse, Gyurme Tenpa Gyaltsen, through the power of his previous excellent aspirations and karma, was able to safely arrive in India as a refugee. He and I have connected as student and teacher". Katok Getse Rinpoche spent many years in retreat and was known for his mastery of Dzogchen. After exile from Tibet, he divided his time between Kathmandu, where he oversaw Katok Ritrod, Chagdud Gompa small retreat center in Pharping (Nepal), India, and Bhutan. This page was last edited on 21 November 2018, at 11:16.